Competition Training Bumper Plates in LBS. Troy Barbell is once again redefining strength with our new competition Bumper plates. Available in pounds, each plate is a perfect blend of precision craftsmanship and Troy quality distinctly crafted and engineered to the tight tolerance and exacting specifications of "I.W.F." Each plate is specifically engineered for Olympic lifters and comes equipped with an oversized steel hub which not only provides a durable core and an extremely tight weight tolerance but also provides each plate with a distinct thin profile. This thin design is the preferred choice when training as it allows the lifter to load more plates on the bar. Premium rubber tested to withstand 30,000 drops. Plates have a dead blow when dropped with little bounce. 450 mm diameter to create a thinner and more durable core. 50.2 mm center hole for snug fit on the bar. These are Troy Barbell's highest quality plates - each plate is precisely crafted to an amazing (plus or minus) 2 gram tolerance. These plates are designed and engineered with the strict regulation standards of the International Weightlifting Federation in mind. Other amazing specifications include an oversized steel hub in the core - this both makes the core of the plate much stronger, and also allows for thinner plates, which lets the serious weightlifters put even more bumper plates on their bars. 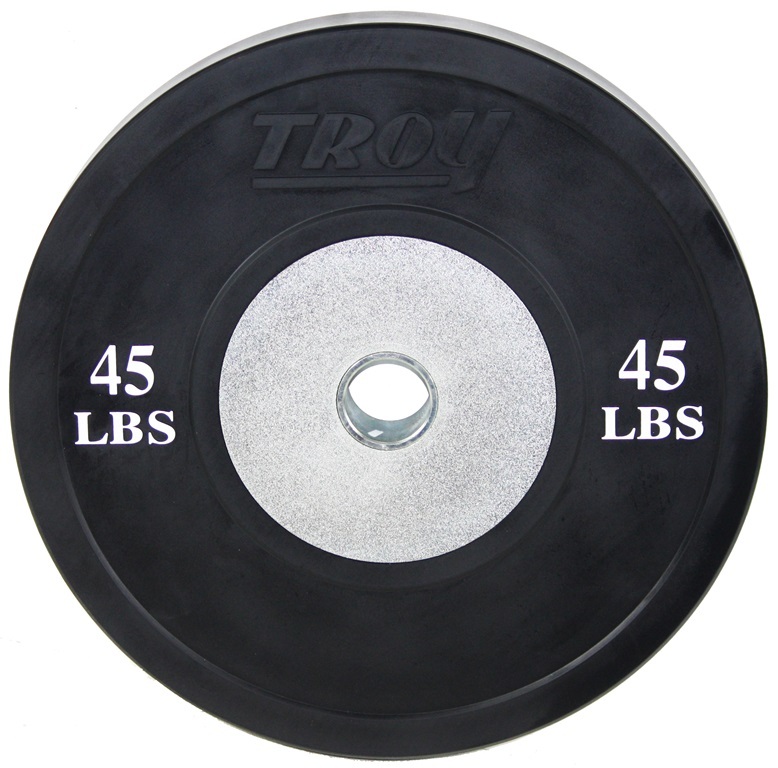 Order your pair of the Troy Competition Olympic 45lb Bumper Plate BCO-045SBP from FitnessZone.com today!